This is as different from my last review as chalk from cheese. While political undercurrents are not too far from the surface, Phörpa (The Cup) is a simple tale culled from real life. Young Tibetan children are often sent far away from their families to monasteries in India and Bhutan so they can be brought up in the Buddhist way of life. This film, set in one such monastery in Himachal Pradesh, narrates events that occur among a people who have lost their homeland, and have no hopes of regaining it. Against the background of the 1998 Football World Cup, it shows how small joys still bring much happiness amidst the uncertainties of life. It is early morning in the monastery and the novices are getting ready for the day. Until the arrival of the second-in-command, Geko, puts a dampener on their festivities. The old abbot is packing. Again. Geko is sympathetic but pragmatic about their future. They are expecting two boys from Tibet, and the abbot is worried. With reason. It is now a crime to even possess a photo of the Dalai Lama in Tibet. The boys finally arrive with their guide, who informs the abbot that they had had trouble with the Nepalese border patrol. Orgyen (Jamyang Ledro), one such boy who had been spirited out of Tibet some time ago, is hard put to follow the discipline of the order. He is obsessed with football (soccer, to the uninitiated), and is more often than not, pretending to be Ronaldo. He is so football-crazy that the wall of his room is a shrine to the Gods of football. He sneaks out of the monastery at night so he can go watch a football game on television, and is even willing to bet his kitchen shift that France will win against Italy. Unfortunately for him, he and his companions-in-crime are caught by Geko as they creep across the courtyard in the middle of the night to watch yet another game. Orgyen is like an India-rubber ball. He just cannot be squashed. With the motto of In for a penny, in for a pound, he pleads with Geko to be allowed to watch the World Cup finals. After all, it is going to be Brazil vs France. If only Geko would allow them to rent a television and a dish satellite? And so, the abbot agrees, and the monks, under the leadership of Orgyen, begin collecting the necessary funds. Even Geko, stern, disciplinarian Geko, gives the little that he has. They are still a little short, but Orgyen is optimistic. They can pay later. However, the Indian who is providing them with the equipment is a canny businessman. No credit please, he says. Orgyen is flummoxed. They have already tapped into their meagre resources; where are they going to get the remaining amount? They do not have much time if they want to set the TV up before the match begins. Ingenious if nothing else, Orgyen manages to persuade a compatriot to part with his most precious keepsake to make up the shortfall. The goal is attained, the TV fixed in time for the much-awaited finals, even the abbot has been persuaded to watch, and Orgyen's beloved France is winning. Only, Orgyen finds, much to his own discomfiture, that his conscience is a little more active than he would have liked. The narrative is as slow and gentle as the abbot himself, a man who is at once suffering from his forced exile from his homeland and accepting of the reality that he will never return, not in this lifetime. In sharp contrast is young Orgyen, whose enthusiasm and passion for life fill the film and paint it in brighter colours than we first expect. The film meanders leisurely through the lives of these two, and the others who reside at the monastery, lingering awhile on their inherent normalcy while subtly emphasising the political situation that is the Tibetan reality. The humour is mellow, never in-your-face, never slapstick. It arises organically from their daily interactions, and much of it comes because the viewer can relate to the incidents on screen. The bewilderment of the rather unworldly abbot at having to deal with the decidedly 'unspiritual' football-obsession makes you smile. Finally, the monks are also young boys and adolescents and they are no different from other boys their age. Many of the scenes could have been set anywhere in the world, and it would not have been out of place. Set against the serene world of a Tibetan monastery with its underlying notes of loss and homelessness, it takes on a more serious meaning even while it is layered over by the more obvious scenes of everyday life. 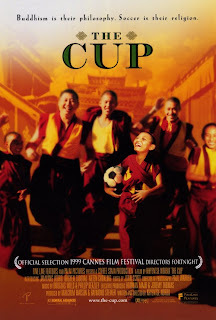 The young monks playing football with a Coco Cola can, or drawing graffiti on the monastery walls; sneaking football magazines and swimsuit issues of sports magazines when they should be studying; the novitiate falling asleep during morning prayers, for instance, or a trainee making an origami bird to tease Orgyen, while he responds by making a thumb puppet; Orgyen humming O jaane jaana whilst cycling back from the village, or passing notes when he should have been praying... It shakes our perceptions of monks leading austere, joyless lives. The ordination scenes in the film were real, as were the two refugees who were ordained as monks in the film. Based on a true story and filming with an amateur cast (monks in real life), this is Bhutan's first film to be shown internationally, and also the debut film of its director, Khyentse Norbu, an eminent Buddhist himself. He is otherwise known as Dzongsar Jamyang Khyentse Rinpoche, the direct incarnation of the Khyentse lineage in Tibetan Buddhism. The feeling of belonging to a nation (which, incidentally, the monks miss), the sense of loss that underlines pretty much everything in the monks' lives, the difference between the older monks who have undergone much trials and tribulations and the younger ones, who, though cut off from their families, have yet been 'free' in a sense that their elders haven't -- all this is poignantly underscored by what football (and in a larger sense, sport itself) means to many people -- it proffers a sense of identity, a feeling of national pride, and what is most poignant is that all of this is far more precious to a people who have no homeland. This underlying sense of sadness is evident right through the film - in the abbot packing, for instance, even though he knows he will not go 'home' in his lifetime, or in the letters and the children who are smuggled through the borders, their parents scrimping and saving every last penny, and often selling off whatever little possessions they have so their children can be brought up in the Buddhist way of life... yet Norbu keeps a firm hand on his material, never allowing it to become overtly preachy or a means of political propaganda. If you haven't seen this little gem of a film already, do watch. 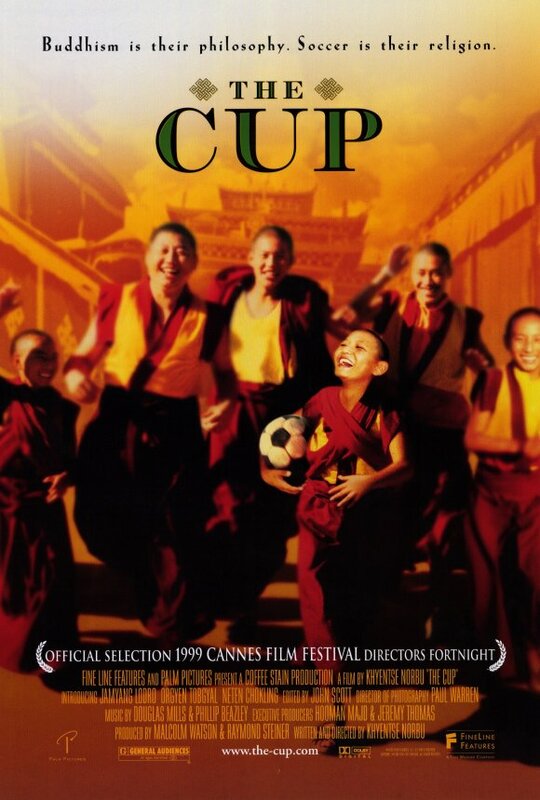 *Trivia: The football games that are shown in the film were the quarter finals of the 1998 World Cup between France and Italy, and the finals, where France beat Brazil 3-0. I clicked on your link - I liked how you co-related sport and war. Anuji seems to have travelled all the way that monastery to see the setting for herself! (A lighter way to welcome her in her own home!!) We, the readers are indeed benefited by such an 'authentic' review' after her long hiatus from her presence on this space. This film is one more illustration of the human spirit's uncanny knack to find its own expression, under any set of circumstances. Oh, how did I miss this one? I've never even heard of it. :-( But it sounds so wonderful, Anu - am adding it to my wishlist, right now. Thank you for the review, so well written that I was literally gritting my teeth and muttering,. "Where will I get the time, Anu? Where will I get the time?!" as I was reading. Oh, do, do watch, Madhu, it's such a sweet movie and both the boy and the second-in-command monk do such a fantastic job! It's available on YouTube by the way, though I do not know for how long. Yep, as alive as I can be online; will talk about that when I mail you...Video cassettes! Scratching my head wondering when I last saw a movie on a video cassette - think it was watching Manichitrathazhu way back in the mid-90s, in one of those Gulf-origination VCDs.. Watched Phorpa at a time when I used to spend a lot of time watching foreign films after downloading them..Looks like a long, long time back now..
Anu, this is simply a wonderful movie! I am so glad you reviewed it. I watched the movie in a theatre in Denver, I think, in 2001 or so. Will keep my eyes open for this one! A BIG thanks for bringing this to our notice. We need more such films! Beautiful, Anu. I'm already downloading it, and will watch it this weekend. I have a personal connection with the Tibetans having to flee their homeland. A lot of them have been given a settlement in the region of Mussoorie and we had several children studying in the school where I taught. Once we had some guests staying over at the school and one was the daughter of the author of the book 'Daughter of Tibet' by Rinchem Dolma Taring. It was one of the most fascibnating autobigraphies I've ever read.Even as I write my heart feels heavy at a way of life that is lost, as was described with such wonderful detail in the book. Thank you, pacifist. Their plight is heartbreaking, isn't it? My personal experience with their issue was way back in the mid-nineties when we had gone to Kodaikanal on a holiday. There is a huge itinerant Tibetan population there in summer, and they come there to sell shawls and sweaters. I picked up a couple of excellent shawls as gifts, and got talking to the girl who sold them to me. It was so sad to listen to the longing in her voice as she talked about how they could never go back. I did an article on her; if I can find it, I'll put it up. Thank you! :) It feels good to be back! Yes, do watch it, Lakshmi. It's such a sweet film. Thank you, Anu! Will download it, so that I can watch it later, if I don't get the time now. Just finished watching phörpa. It's the most heart warming film I've ever seen. Simple story (inspiration from real incidents) and yet so engrossing. It is wittily subtitled, and I chuckled several times. Loved the ending with that sentence LOL! I'm so happy I wathed it. Thank you so much for the recommendation Anu. You're welcome, pacifist. I'm so glad you liked it. You are funny! :) The Cup is definitely more than half full in this film, and no, you don't have to sit under a tree to know that. Just watch the film, and then tell me what you think. Sorry, I know its bad humor but the title is practically asking for it. I will watch it. It made me grin anyway, so it can't have been bad. :) Or perhaps I like bad jokes. Yes, do watch it.